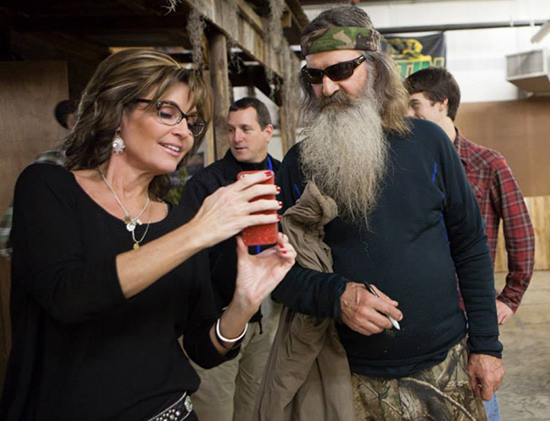 Duck Dynasty patriarch Phil Robertson met with Sarah Palin last week. Phil Robertson blew off liberal journalist Barbara Walters to go duck hunting. Many celebrities look forward to a Barbara Walters interview. Not so with Duck Dynasty star Phil Robertson. He skipped the interview to go duck hunting. Radar Online is reporting that Robertson bailed on Walter’s ‘Most Fascinating People’ interview last month for the ABC network. Walters talked with other members of the Robertson family, and Phil’s wife, Miss Kay, reportedly told her that the 67-year old founder of Duck Commander would rather shoot ducks than do the interview.